Pia Carrot Wallpaper: Would You Like A Flower? 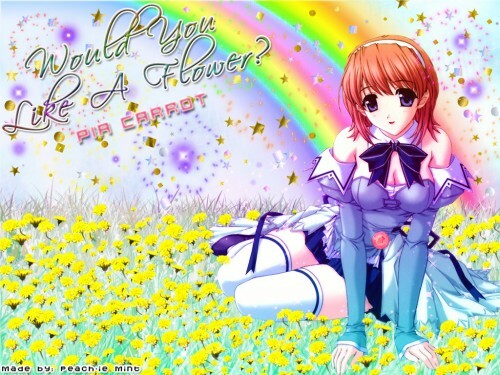 Minitokyo »	Pia Carrot Wallpapers » Pia Carrot Wallpaper: Would You Like A Flower? Oh very colorful, a pretty field and rainbow too. good work there peachiment. Wow, crazy wallpaper but in a good way! The scan is wonderful! She's very adorable! The flowers are terrific! Cool rainbow! omg!!! its so pretty! the colors are so nice!!!! *o* *my eyes sparkle & my mouth open * lol its so nice! the rainbow and the bakround!! soooooo pretty! Wow, really nice!! I love how the dandelions and grass are there. I also love the sky. It's so pretty like fire works and it seems like it's full of surprises XD It's soo pretty!!! Quote by NinjaOh very colorful, a pretty field and rainbow too. good work there peachiment. pretty field and rainbow too ;) its beautiful!! But the grass and the flovers are not so nice. The chara is flovting on tham. Like the stars around her. I love it!! all on this walli is great! The scan, the flowers, the background. great wallpaper! the way how you blended the background with the character gives a natural feeling. keep it coming! All I can say is this is the brightest and most vibrant "Pia Carrot" submission. Between the purple stars, the dandelions and the rainbow, not to mention the kirei onna (who is the subject ! ;-) I have no reason to be depressed or sadden, especially when I see this very kirei pix of a lovely onna like her. Her purple dress fading to a soft turquoise (bottom) I like the effect of change on her :-) Thanxs for the share. U did very well w u're submission "*i*"